Worried about getting your salmon at a fair price this year? Pre-order to lock in the best deal! 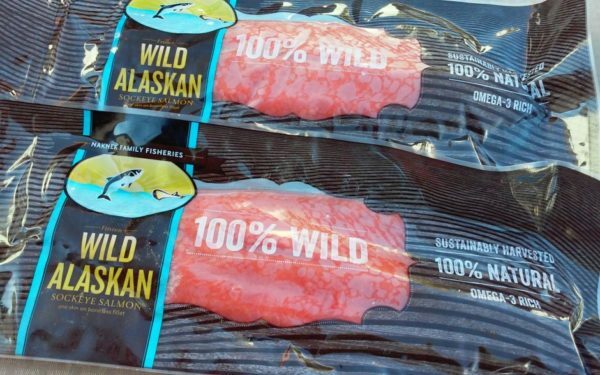 This salmon is 100% wild and natural. From catch to plate, we ensure that you will be getting the best quality salmon available in Alaska. All of our fishermen ice their fish right out of the net, and bring us the best that they have to offer. This year, we are offering a special “Fish Future” price for sockeye salmon fillets. This is at a significant discount from our typical Tucson price of $15 per pound. Please note: free shipping is only within the State of Alaska. All orders to the lower-48 will be shipped via air freight (Alaska Airlines) and will be shipped C.O.D. to the airport. The price is for a 50-pound box of frozen sockeye salmon fillets, vacuum packed. If you are in the Tucson metro area, this price includes FREE delivery right to your door. Order your box of salmon today! 50 pounds of pure, wild, Alaskan sockeye salmon. Direct from the source. 6 generations of commercial salmon fishermen bring you only the finest available Alaska wild sockeye salmon available.